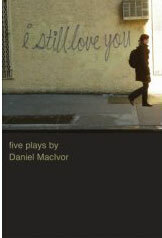 Nova Scotian playwright-actor Daniel MacIvor's new collection of plays, which has won this year's Governor General's Award for English drama, is called I Still Love You�but if Ibsen hadn't already beat him to it, he could just as easily have titled it When We Dead Awaken, or maybe even Ghosts. There's nothing like a roundup of a writer's work to bring out a recurring theme; while I've been a MacIvor fan for many years, it wasn't until reviewing this book that I realized how many of his characters speak to us from beyond the grave. The five pieces here, which range from 1991's Never Swim Alone to this year's A Beautiful View, are all memory plays in which dead people are revived, so to speak, or channelled by other characters to tell their tales. As the dead are all relatively young and have often died in painful circumstances (by drowning, AIDS, a car crash, a bear attack), there's an undercurrent of tragedy running through the stories�but only an undercurrent: MacIvor's writing is irresistibly comic and clever, and while his outlook may be melancholy, it's not pessimistic. In several instances he ends the plays with suggestions of some kind of afterlife and/or affirmations of the power of love. Hence, the umbrella title of I Still Love You, which is, like the phrase "nothing is enough"�the motto of the two women in A Beautiful View�a half-empty or half-full statement: it might suggest the lingering mournful love for someone who has died, but it can also mean that love endures in spite of everything. A collection like this is also illuminating in the way it shows the playwright's development over a span of fifteen years. The earliest play, Never Swim Alone� about male rivalry at the expense of compassion�is the weakest one, relying more on performance than text for its effect, but in it MacIvor experiments with postmodern techniques that grow increasingly complex and, as the reader sees, their application becomes more assured in each succeeding play, reaching a pinnacle with the thrillingly fragmented and multilevel In On It. In between, we get The Soldier Dreams and You Are Here, two larger-scale works with casts of eight and eleven, respectively, in which MacIvor the postmodernist meets MacIvor the more conventional author of plays like the popular family drama Marion Bridge (turned into a fine film starring Molly Parker in 2002). The Soldier Dreams, from 1997, could be regarded as the playwright's belated contribution to the canon of AIDS plays, although the moribund hero's illness is never named and it's only implied that he contracted it through a brief liaison with a German medical student. As David lies semi-comatose on his deathbed, he mutters enigmatic, Rosebud-type statements that his sisters, brother-in-law and lover attempt to puzzle out� when they aren't quarrelling or trying to eulogize him, each in his or her clumsy way. At the same time, we are given glimpses into David's mind and discover the meaning of his mutterings as he relives his fateful night with the student. MacIvor uses two actors to play the living and dying David, and has characters break the "fourth wall" of the stage to address the audience with their eulogies. In most respects, however, The Soldier Dreams is a fairly typical entry in the elegiac genre. He gets more ambitious with You Are Here, a play originally developed and staged in 2000 at the National Theatre School of Canada, whose resources allowed him to flex his dramatic muscles with thirteen characters and a longer, two-act structure. The play charts the messy, mediocre life of Alison, from university to her premature demise in middle age, which she herself both narrates to us and relives after death (more postmortem postmodernism). Hers is a rocky journey full of disappointments. Starting as an entertainment journalist with no real passion for writing, she marries a psychologist and frustrated screenwriter, suffers a miscarriage, and tries to make her husband happy by producing a film of one of his scripts, only to lose him to the film's star. The picture fails, and she ends up as a wine-bibbing, coke-snorting hack living with a crass young gigolo. Sounds dire, but in fact it is compulsively fascinating, like a soap opera. Confused Alison is a sympathetic figure as she gazes back over her life, and finally, in retrospect, appreciates the one longtime friend she has always loved. MacIvor pulls back to the one-act, two-hander with In On It, but gives his audience/readers an even bigger emotional jolt. This is a play with the same technical dazzle as Monster, the brilliant third work in his much-toured series of self-performed solos that also includes House, Here Lies Henry and Cul-de-sac. Functioning on three levels, In On It is essentially about a man creating a play to explain the senseless death of his lover, who was killed in a head-on collision with a person driving a blue Mercedes. On one level, we get the imagined story of the suicidal Mercedes driver, a terminally ill middle-aged family man named Ray; on another, the creation and performance of the play about Ray by the playwright Brian, in fractious (and perhaps imagined) collaboration with his dead lover Brad; and on the third level, the past relationship of Brian and Brad, up to the time of the latter's sudden death. Confusing enough? The shifting planes of reality, along with the humorous bickering of Brad and Brian, prove an entertaining distraction until it becomes clear that, under the tart wit and the theatrical sleight-of-hand, this is really a sombre play about dealing with loss and regret. As in You Are Here, the central character tries to go back and rewrite the mistakes of the past, only to be crisply reminded by the dead, "That's not how it went." A Beautiful View, which made its debut this past February at Columbus, Ohio's Wexner Center for the Arts, is an upbeat variation on the themes of both In On It and You Are Here. Like the former play, its focus is an intense relationship, which here grows out of a comic misunderstanding�the two young women in the play, L and M, both consider themselves heterosexual and, when they first meet, assume the other one is a lesbian on the make. Eventually, however, their mutual attraction transcends such definitions and endures over the years, managing to outlast their various relationships with men and even a near-fatal betrayal. Unlike Brad and Brian of In On It, however, L and M are allowed a grim gift: they get to die together. And we ultimately realize that, as with Alison in You Are Here, their engaging re-creation of their lives for us is taking place after death. But, as the play's gentle epilogue suggests, love carries on regardless. Martin Morrow is an award-winning theatre critic and the author of Wild Theatre: The History of One Yellow Rabbit.